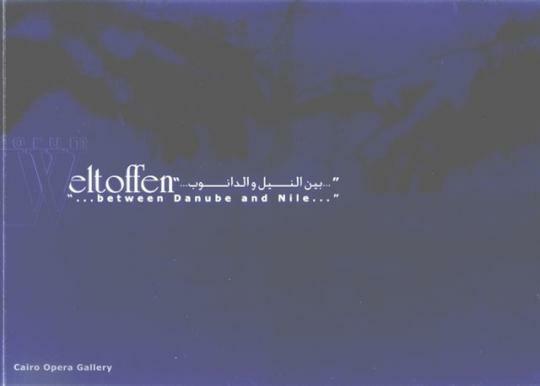 17. november 2002 exhibition catalogue, 52 pages, 24x17 cm in colour, published in cairo with texts in englisch and arab by samir faarag, ferdinand trauttmansdorf and fate velaj. the head of forum weltoffen mr. fate velaj is endeavouring to deepen the sense of cooperation among the world nations despite the difference of their backgrounds, religions and political system. they are gathered through art and culture to discuss and show their works which reflect the culture and civilisation of their countries. in this exhibition we had the opportunity to dialogue with some foreign artists in a respectful and appreciative manner. twelve artist participants from egypt who resembled samples of the egyptian art attended this show namely dr. magdy abdel aziz, who played a big role in the coordination and organisation of the exhibition, dr. hussein el gebali, dr. aida abdel karim, mr. makram hunein, mr. khamis shehata, mrs. fayza abdel moniem, dr. zeynab al zegeny and dr. hazem fathallah, and dr. omar el nagdi. the exhibition received a great admiration from critics artists and university professors and was visited by a great number of the audience who witnessed its big success .it also was covered by some informational channels such as orbit, the enlightenment channel and the good morning egypt channel, nile tv. news 1, etc, as well as official newspapers published many items about it and its importance. we are looking foreword to greater cooperation in this field because such exhibitions do have a great incentive to peace and an assertion that egypt is a peaceful country which embraces wide world art. history is heavily influenced by the migration of people from one country to another. they contribute in enriching our society economically and culturally. forum weltoffen has set itself the task to discover this creative potential present in all cultures, to make it visible and to use it in the development of society. through different cultural activities we try to bring cultures together in order to foster greater mutual the development of society. art and culture should act as a bridge allowing people to meet in an open and open minded way. here in cairo we are showing multicultural austria at its best in the hope that in can act as an example in a world full of complex problems which is now more than ever looking for peaceful solution. we as artists cannot solve these problems but as creative and critical members of society we offer new ideas, concepts, perspectives and genuine alternatives. at the same time we are the best example for more dialogue, tolerance and understanding. artist try to make our world a better place and i am convinced that our exhibition in cairo is a step in the right direction and represent a small contribution towards achieving this goal. therefore, i would like to thank all the contributing artists from very different parts of the world and all the contributing artists from egypt who have both declared their readiness to participate in this new and unique initiative. i also would like to thank all institutions involved in the preparation of the exhibition.